Damage to the shoulder may result from repetitive movements, manual labor, sports, or aging. A person may also injure this part of the body due to a bad fall or accident. Many people visit the doctor with front, or anterior, shoulder pain. The shoulder is a mobile structure that allows the arm to move freely in all directions. Shoulder problems may limit arm movement, causing pain or discomfort. These bones interact at four joints. A joint called the glenohumeral or shoulder joint connects the upper arm bone and shoulder blade. Although surrounding structures provide support, this joint is susceptible to injury. In this article, we discuss some common causes of front shoulder pain and explain how doctors diagnose and treat them. Causes of front shoulder pain include rotator cuff injury and osteoarthritis. Shoulder pain can develop from problems in any part of the shoulder. Damage to the joint may result from repetitive movements, manual labor, sports, or aging. It may also occur when a person has a bad fall or accident. Some injuries may cause a sudden onset of shoulder pain. Examples include dislocations, separations, and fractures. The rotator cuff comprises muscles and tendons that act to stabilize the shoulder. Bursae, which are fluid-filled sacs, reduce friction between the shoulder structures. The rotator cuff tendons, which connect the muscles to the bone, are vulnerable to compression from surrounding bony structures. Rotator cuff tendinopathy, or injury to the rotator cuff tendons, may develop from repetitive activity, generally at or above shoulder height. People with rotator cuff tendinopathy may have pain around their shoulder, particularly when reaching overhead. Impingement occurs when the acromion, a part of the shoulder blade, puts pressure on the rotator cuff tendons and bursae. It presents in an almost identical way to rotator cuff tendinopathy. Rotator cuff tendon tears may result from sudden injury or slow, degenerative change. Symptoms include shoulder weakness and pain, as well as popping sensations during arm movement. Severe tears may impair the use of the shoulder, limiting day-to-day activities. Biceps tendinopathy is an injury to the tendon of the biceps muscle, which may result from repetitive lifting and reaching overhead. Symptoms include pain in the front of the shoulder that becomes worse when lifting, reaching overhead, and carrying objects. Continued performance of these activities may result in the sudden rupture of the tendon. Adhesive capsulitis, which people sometimes refer to as frozen shoulder, may develop from not using the shoulder. People with this condition may experience pain, a decrease in their range of motion, and stiff joints. Common causes of shoulder disuse include rotator cuff tendinopathy, diabetes mellitus, biceps tendinopathy, and trauma to the shoulder. Osteoarthritis, also known as “wear and tear” arthritis, commonly occurs in either the glenohumeral joint or the acromioclavicular joint. In this form of arthritis, the bones rub together as the cartilage between them wears away. Symptoms include pain, swelling, and stiffness in the shoulder joint. Osteoarthritis generally worsens over time. Fractures, or breaks, occur most often in the collarbone or upper arm bone. Both types of fracture may result from a fall onto an outstretched hand or a blow to the shoulder. In most cases, they will cause severe pain, swelling, and bruising. The shoulder will be tender to touch around the injury, and the bones may appear out of position. Shoulder dislocations occur when the ball of the upper arm bone pops out of its socket. The arm bone may dislocate forward, backward, or downward, either partially or completely. Dislocations may recur if the surrounding structures of the shoulder become worn down. Symptoms include pain, swelling, numbness, and weakness. The arm may look out of place. A shoulder separation occurs when the ligaments tear. The ligaments are tissues connecting the bones and cartilage. Separations in the acromioclavicular region between the collarbone and shoulder blade may occur from falls or direct blows. Symptoms include pain, swelling, and tenderness in the front shoulder, as well as a bump at the point of separation. Physical therapy can improve shoulder strength. People can manage many types of shoulder problem at home. Treatment typically involves a period of rest and avoidance of activities that aggravate the pain. A doctor may also recommend applying heat or ice to the injury for pain relief, as well as placing pressure on the area to reduce swelling. 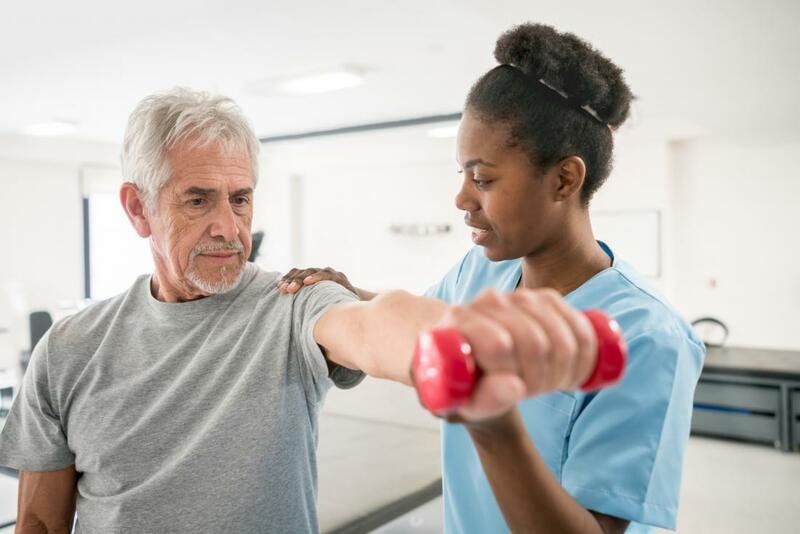 Physical therapy improves shoulder strength and flexibility. Slings can be helpful in managing shoulder dislocations, separations, and fractures, as they keep the structures of the joint in position. Before applying a sling, a doctor will put the bones back into place. Sometimes, doctors recommend medication to reduce pain and inflammation. Over-the-counter drugs, such as ibuprofen and aspirin, are available. Doctors can also prescribe medications and inject steroids or numbing medicine directly into the shoulder to relieve pain. Some injuries require surgery for treatment. For example, rotator cuff tears and adhesive capsulitis do not always improve with rest and medicine. Severe rotator cuff tears or recurrent dislocations may warrant early surgical consultation rather than a trial of at-home management. Several conditions lead to shoulder pain. A thorough clinical evaluation helps pinpoint the cause. A doctor will take a medical history and carry out a physical examination, during which they may ask the individual to perform several specific movements to assess the injury. They may also order lab and imaging tests if they need additional information. If the pain is mild, it may not be necessary to visit a doctor right away. Some people prefer to rest and see if the pain will go away. If the pain does not improve, it is best to go to the doctor for further evaluation. Shoulder pain is a common complaint. The unique anatomy and range of motion of this joint make it susceptible to injury. Common triggers for injury include accidents, repetitive movements, manual labor, sports, and aging. An injury that causes severe pain requires immediate care. A person should also see a doctor right away if they have any joint deformity, sudden swelling, an inability to use the joint, weakness or numbness in the arm or hands, or intolerable pain.